DJ DeLuxe is delivered as a self-executable file. Double-click on the setup.exe file. Like most Windows installation programs, it will prompt you to confirm the installation location, etc. The installation package will by default create an DJ DeLuxe program group and Start menu icons. You can change the location of the icons if necessary. To completely remove the DJ DeLuxe software from your disc, simply click on the icon "Uninstall DJ DeLuxe" to uninstall DJ DeLuxe. Some log files may be left at the location where you installed DJ DeLuxe. If you want no connection history left please remove the datasource.dld file. The right area shows all the days with data. It shows the day, the actual route and the lenght of the route. 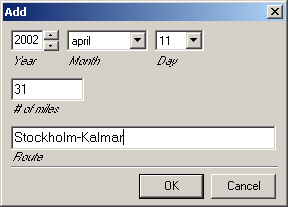 "Delete" will delete the selected day in the right area. "Edit..." Edit the selected day in the right area. See Edit window for more info. "Add..." Add a new day. See Add window for more info. Revert Revert to the last time the data was saved. Save Save the data to disk. Employee information... Shows the employee information dialog. See Employee information below. Register... Register here (only if you have received a license key from Daniel Lind). On the Web>DJ DeLuxe Takes you to this web site. On the Web>Other programs from Daniel Lind Takes you to Daniel Lind's web site, which this is a part of. About DJ DeLuxe... Shows the about form. Set year, month, day, the route and the length of the route. The days which are already set is hidden. 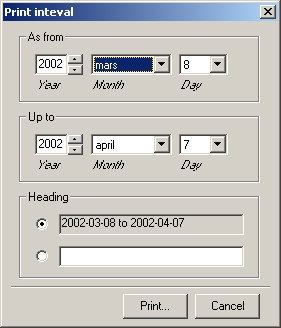 To change an already set day, mark it in the main window and click "Edit..." to get to the Edit window. Here you can change year, month, day, the route and/or the length of the route. Other days that are already set is hidden. 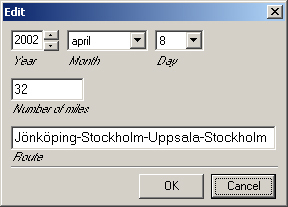 Specify the interval to print and choose an appropriate heading. By clicking on the "Print..." button you are confronted with the ordinary print dialog. This is where you can change the settings for the program. There are two tabs and both are explained below. "Cancel" button discards the changes you have made since opening the "Settings" dialog. "OK" button saves the changes you have made. 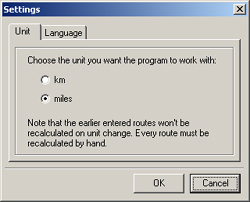 Choose the length unit to use in the program. The data entered is NOT recalculated when changing the unit. On this tab you may change the language in which DJ DeLuxe will run. 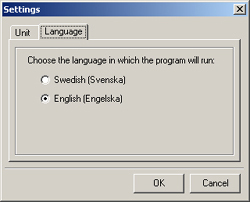 The default language is "English". 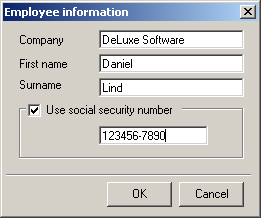 Set the employee information: company, first name, last name and (optionally) social security number. All this information will be printed in the header of the print-out. 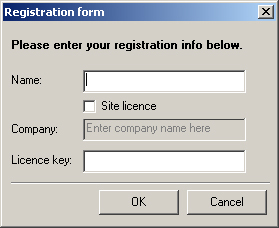 This window allows you to register your copy of DJ DeLuxe. * Please read the license agreements before fulfilling the registration. The name (and company name if it's a site license) together with the unique license key should have been received with mail from Daniel Lind. This section tries to outline most of the error messages and suggests some possible explanations and solutions. Please note you should be using the latest version of DJ DeLuxe currently available. Evaluation period is over. Please register DJ DeLuxe! - You are only allowed to use DJ DeLuxe non-registered for 70 days. After that you have to register your copy of the program. If this message appears the first time you start up the program, please contact me. From 1.2: Install the program in the same folder as the old version. From 1.1: Install the program in the same folder as the old version. From 1.0: Install the program in the same folder as the old version.